This occasional blog will cover an open-ended series of rhyming bike rides in Britain. It will start in July 2010 with Poole (jewel of the south coast) to Goole (fag end of the Humber estuary); swiftly followed by Barmouth (biscuit-tin pride of the Welsh riviera) to [Great] Yarmouth (haven for the natural world - well, natural gas rigs, anyway). These cycle routes have been chosen for two essential qualities. They must rhyme; and they must form some sort of natural endpoints. 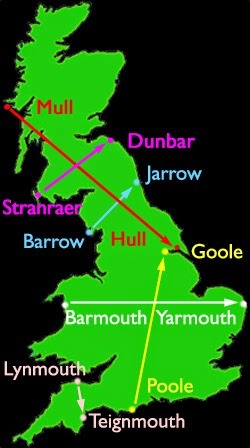 Barmouth to Yarmouth for example: not only does it possess that sonorous, near-A-to-Z lexicality, but also spans Britain's lower beam horizontally from west to east, considerately following the prevailing wind. It's a satisfying coast-to-coast ride, and a natural successor to the Cape Wrath to Dover adventure that I did (and blogged about) in May 2010, along with several companions. Poole to Goole works too: a nor'-nor'-east line, agreeably complementing Barmouth to Yarmouth, largely following the Roman Fosse Way from England's seaside south to its north-eastern container-port orifices. We'll no doubt be adding more bike rides to the vowel-harmony couplet roster as we go on.